Today, we have a number of pending cases in all the courts of India. In the January 2017, there are 2.81 crore’s pending cases in the Supreme court of India and also 5000 judges were shortages across India. But now it was drastically reduced. How it would become possible? It would become possible only through Lok Adalat. So Let us see what is meant by Lok Adalat? And how it will works? 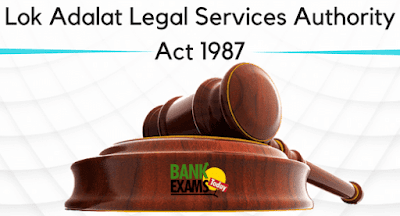 A Legal services authority act was enacted in 1987 which was enshrined in Article 39 – A of the Constitution of India for free legal services to the citizens of India. In this act, all the authorities were called as statutory bodies in which they were provided free aid to a person who hadn’t capable of bear case expenditures and also appointed a lawyer for a person who is going to be a defendant in their case. These authorities were organized LOK ADALAT (called PEOPLE’S COURT) from out of the court settlement. Lok Adalat is also known as People’s Court in which parties to a dispute settle their dispute through conciliation and compromise. It is also one of the alternative dispute redressal mechanisms. Conciliation means alternative dispute resolution process in which parties to a dispute settle their cases voluntarily from out of the court settlement. Here, parties to a dispute appoint a mediator to resolve their cases. It was conducted by NALSA (National Legal Services Authority) and other legal services institutions in India. The Lok Adalat is presided over by a sitting judge or retiring judge as a chairman and two other members as a lawyer and social worker. The main condition of the Lok Adalat is that both parties to the dispute should accept for settlement. And also there is no court fee for the settlement of the disputes. Even though the dispute was already filed in court, the court fee would become refunded if it had been settled in the Lok Adalat. The judgment/awards/ decree of the Lok Adalat should be final and there is no appeal for their decision. The decision of the Lok Adalat could be executed through the legal process. There are two types of Lok Adalat. They are permanent and non – permanent Lok Adalats. The Lok Adalat is very useful to settle the cases like money claims, partition suits, damages and matrimonial cases, etc. Every Lok Adalat should have own jurisdiction to determine and to arrive at a compromise and settlement between the parties to the dispute in respect of any case pending before the court and any dispute at pre – litigative stage. The central government might constitute the body called National legal services authority in which they had conducted Lok Adalat at regular intervals. For every month the Lok Adalat has been held on a single day for throughout the country right from the Supreme Court till Taluk level court. The national legal services authority consists of the chief justice of India, the sitting or retiring judge of the Supreme Court and such other members. These would develop a fund called National legal aid fund which should be utilized for state-level legal aid programmes and schemes. These authorities had constituted the Supreme Court legal services committee for the purpose of performing their powers and functions. The state government might constituted the body called State legal services authority in which they had conducted Lok Adalat at regular intervals. The state legal services authority consists of the chief justice of the High court, the sitting or retiring judge of the High Court and such other members. These would develop a fund called state legal aid fund which should be utilized for state-level legal aid programmes and schemes. These authorities had constituted the High Court legal services committee for the purpose of performing their powers and functions. The state government in consultation with Chief justice of High court might constituted the body called District legal services authority in which they had conducted Lok Adalat at regular intervals within the district itself. The district legal services authority consists of the district judge and such other members. These would develop a fund called district legal aid fund which should be utilized for district-level legal aid programmes and schemes. These authorities had coordinated the activities of the Taluk legal services committee and other legal services in the district. The state authority might constitute the committee called Taluk Legal services committee for each taluk or mandals or for the group of taluks or mandals to coordinate Lok Adalat and their legal services within the taluk or mandala itself. This committee was headed by a senior civil judge who is its ex – officio chairman operating within the jurisdiction of the committee. Here all the administrative expenses and cost of functions were met out from district legal aid funds. They were laid down effective policies and programmes for the purpose of making legal services available easily under this act. They were made most effective and efficient schemes for the sake of parties to the disputes. They have utilized their funds only for legal services efficiently and also allocated their funds to state level and district level authorities. They took various necessary steps by way of social justice litigation with consumer protection and environmental protection activities. They had trained social workers for legal skills and also encourage the settlement of disputes by way of negotiation, arbitration and conciliation. They had periodically monitored and evaluated the legal services aid programmes and policies. The summoning and enforcing the attendance of any witness and examining him on oath. The discovery and productions of any documents. The requisitioning of any document or any public records from the court or office. Here, The Lok Adalat should have the power to specify his own procedure for the determination of any disputes coming before it. Also, all proceedings before the Lok Adalat were considered as judicial proceedings. And also these courts were considered as a civil court for the purpose of settlement of pending cases and pre-litigation cases. Every state authority by notification should constitute the permanent Lok Adalat in respect of one or more public utility services and for more areas specified by notification. It would consist of a person from a district judge or additional district judge or judicial officers higher rank than district judge of the court as a chairman and two other persons were appointed who had an experience in public services. Any parties to the disputes which was brought before in the civil court could also be made an application to the Permanent Lok Adalat for the settlement of disputes. And also the permanent Lok Adalat should not have a jurisdiction in the matter where the value of property in disputes above ten lakh rupees. This Lok Adalat was guided by the principles of natural justice, objectivity, fair play, equity and other principles. The decree of the permanent Lok Adalat should be final and there is no appeal and also not to be called in question in any original suits. They could also forward their decree/award to the civil courts for the execution parts. The legal services authority act 1987 was enacted to provide easy and cheap cost legal services to the weaker sections of the society and to protect justice which should be denied to the weaker poor societies. This should be very innovative mechanism nowadays. And also there would be the number of amendments under this acts. This act would be very useful for public utility services like transport services, postal, telegraph, the supply of water and power, sanitary facilities, etc. Also, the cases related to public utility services were Mahanagar Telephone Nigam Limited, Delhi Vidyut board, etc. These cases were needed to be redressed speedy so that the people would be got justice without any delay even at the pre-litigation stage and also this would result in reducing the workloads of the courts at a regular extent.